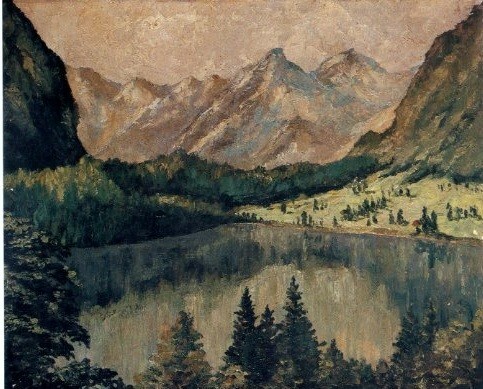 A Hitler painting, not on exhibit at the Neue. 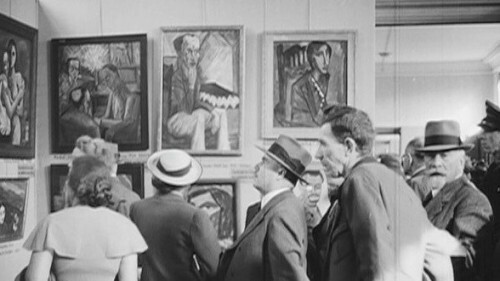 Germans view the exhibit in 1937. The Nazis seized ‘degenerate art’ from museums and private collections. A three-year traveling exhibition of this art toured Germany and Austria. Most of the paintings were sold, lost, or presumed destroyed. 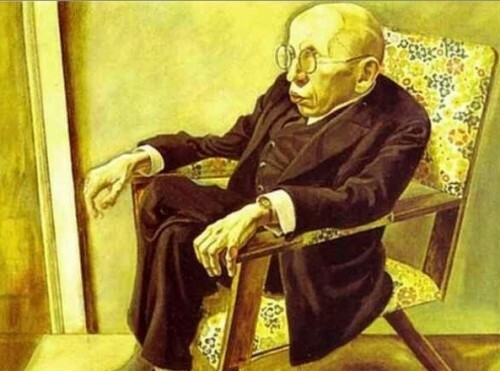 The recent discovery in Munich of the Gurlitt trove of such artwork has attracted attention. The film The Monuments Men, directed by George Clooney, is about the seized art. Highlights of the show include a number of works shown in Munich in the summer of 1937, such as Max Beckmann's Cattle in a Barn (1933); George Grosz’s Portrait of Max Hermann-Neisse (1925); Erich Heckel's Barbershop (1913); Ernst Ludwig Kirchner's Winter Landscape in Moonlight (1919), The Brücke-Artists (1926/27); Paul Klee's The Angler (1921), The Twittering Machine (1922), and Ghost Chamber with the Tall Door (1925); Oskar Kokoschka's The Duchess of Montesquiou-Fezensac (1910); Ewald Mataré's Lurking Cat (1928); Karel Niestrath's Hungry Girl (1925); Emil Nolde's Still-Life with Wooden Figure (1911), Red-Haired Girl (1919), and Milk Cows (1913); Christian Rohlf's The Towers of Soest (ca. 1916) and Acrobats (ca. 1916); Karl Schmidt-Rottluff's Pharisees (1912); and Lasar Segall's The Eternal Wanderers (1919), among others. Who has the right to determine the socially redeeming value of art? Rudy Giuliani, then Mayor of New York, stepped into the fray when a portrait of the Virgin Mary mounted on elephant dung by the British artist, Chris Ofili, from the Saatchi Collection was hung in the Brooklyn Museum of Art. The Museum received public funds, and this very much complicates the issue. The Mayor threatened to withhold funding. Artists who work on their own and don’t draw from the public dole have a right to do what they want, certainly a First Amendment guarantee in the US. But in the Third Reich the case was quite different. Der Fuehrer knew that art was important. He was a mediocre, failed painter. US leaders have been artists in their own right: Presidents Ulysses S. Grant, Dwight D. Eisenhower, Jimmy Carter and George W. Bush all have painted, with varying success. What their taste in the work of others was and is, we don’t know. They consider it private. In the process of elevating the German population and purifying it, Hitler chose to be arbiter of the public taste. Movements which civilized viewers consider seminal were removed from sight and buried. But there was a last moment for the German public to view this ‘degenerate’ art in the traveling exhibit. Steven Spielberg provided funds to preserve a fascinating film clip of German citizens walking through the exhibit. Their reaction seems to be fearful, taking a quick look over a shoulder to see who’s watching them looking. Stanley Kramer fictionalized a question that anyone curious about the course of history raises: who knew what when, and if they knew, why did they not raise a voice? Footage of the real Nuremberg trials is in the Anthology Archives in New York. John Ford’s camera offers a chilling insight into the men who forced even the Nazi artist Emil Nolde to leave the country. Nolde is interesting, because the Third Reich hated his art more than they loved his party allegiance. The Neue Galerie is one of New York’s treasured exhibition spaces and provokes as well as pleases. This exhibit is an unusual and important insight into a world we do not want to recreate or forget.